I was born and raised in Chicago, and with a couple of exceptions, most of the next twenty-five years of my life was spent in the Rust Belt cities of Cleveland and Akron, Ohio. Although artistically talented as a child, I have devoted my professional career to cartographic design. In an effort to improve the design qualities of my maps, I took up art with the intention of utilizing what I had learned into my professional work; instead, I rediscovered my artistic roots while living in Ohio and have continued that path since relocating to Maine in 2010. For these reason, I have styled myself as the Rustbelt Cartographer, despite my current location, and, here in a former mill town, because of it. Today, I live in the small and remote rural town of Millinocket, Maine with my wife Susan Mathias and my dog Gus. I can gaze upon Mount Katahdin from my front yard—the northern terminus of the Appalachian Trail within the vast wilderness of Baxter State Park. I also live near the Katahdin Woods and Waters National Monument—there is a lot of geography in Maine's North Woods! 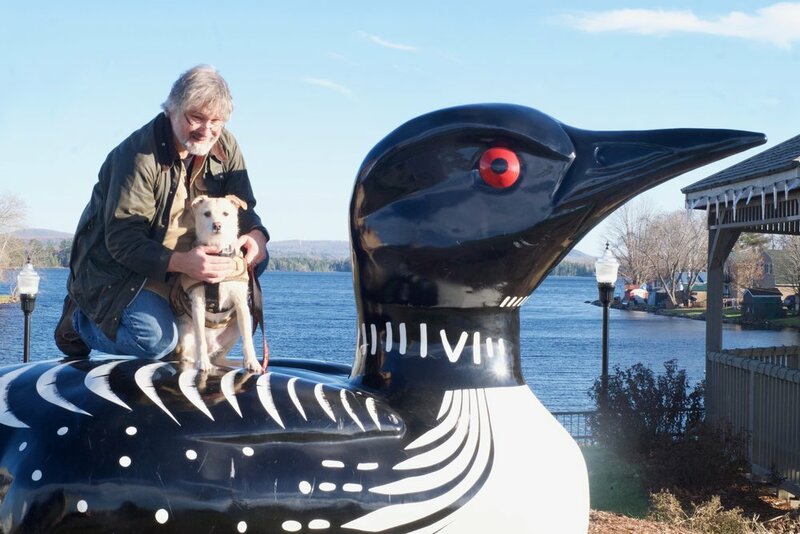 Ken, his good friend Gus, and the loons he hangs out with.